Let’s get rolling! The rolling toy moves quickly across the floor, and colorful treats fly out from both sides. Now the players need to be quick! Pretend to be a dog and chase the rolling toy. 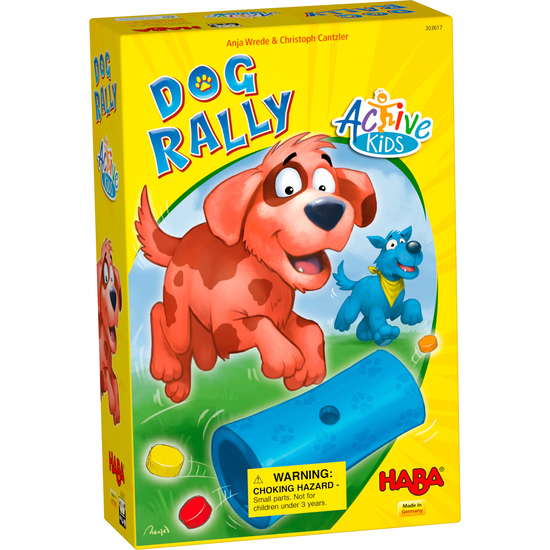 The first player to collect the right dog treats will win the Dog Rally! Contents: 1 dog area (= box base with 4 dividers and 2 tableaus), 1 rolling toy (= cardboard roll), 36 dog treats (wooden cylinders in 3 colors), 1 set of instructions. Short game instructions: • Have ready the assembled dog training area; each player selects a patch of lawn in the dog training area. Take 2 treats of each color from the stockpile and stick them into the opening of the toy roller. • Kneel in a row on the floor and roll the toy roller forward with momentum. • A the same time, crawl on all fours behind the toy roller and collect the treats as they fall out. • Sort the collected treats into the matching color holes of your own patch of lawn. • The player who fills their patch of lawn completely with color matching treats wins.